Just a quick post to say that this coming Saturday afternoon, evening, and Sunday morning, I’m with Fresh Springs Church, Seaford, East Sussex, they meet at the Clinton Centre, Clinton Place, Seaford, BN25 1AU. All the meetings are open, but of course I wouldn’t want to encourage you away from your own church meetings over that weekend! It’s the first time I’ve ever spoken in Seaford: so a new experience, but when my dad and mum moved down to Sussex from London, in 1958, we rented a house there temporarily whilst the one dad and mum bought was being built, and even then, from where we moved to (East Dean), it was where I went to junior school. I’m believing that the experience this weekend will be better than my extremely un-fond memories of junior school ,and the psychotic woman head teacher, who hated left handed people! It was my ‘misfortune’ (then) to be left handed – I still am, of course, despite her attempts to ‘communistically’ re-educate me by caning me four times a day for the last four years of school, on my left hand of course! The school disappeared off the planet many moons ago (as did she – I like to say, sadly, but it wouldn’t be true!! ), and I’m really looking forward to going there and seeing God do some miracles, healings, and bless people…. I do have happier memories of the sweet shop that used to be opposite the school, though – I still live with the waistline to prove it! If you can come, especially Saturday, it’ll be great to see you! One of my favourite American preachers/prophets, Lance Wallnau, posted this yesterday, and, as often with Lance’s stuff, and a few other people, it started a train of thought in me…..C S Lewis’s quote is very challenging in and of itself, and far be it from me to try and add to such a man’s sayings, but this is where God took me from there…! As something of a ‘heart on the sleeve’ person, I’m only too aware of the danger of falling into the ‘tap’ so excellently worded by C S Lewis’ – I always want to love people, it’s one of the driving forces behind the last 30 years of my life: it’s why, when I’m involved in a meeting, I can’t just walk along a line of people – many of them NEEDING to be loved – saying ‘be healed’ and pushing them over. I like to sit with people, at least for some minutes, and get to know a little about them, before I’ll pray for them. Often, then, the prayer itself MIGHT be short: if it’s for healing, then frequently it’s just a ‘command’ – ‘in the name of Jesus’. Other times, it’s longer…. (I’d have to confess, though, to NOT being a ‘long-term’ counsellor!). But in wearing my own heart on my sleeve, I know that, like the people who make themselves ‘vulnerable’ and open to me, in ministry times, I make myself open to major vulnerability, and, as Lewis said, the alternative is something I don’t even WANT to consider. The trouble is, there are people who hear me tell the ‘stories’ – I prefer them as ‘testimonies’ (stories can be misinterpreted as made up: that’s one of the countless reasons I love to take other people with me, so that they can know the testimonies, and experience God using them to return home and relay those testimonies to others). And, of course, Revelation 19:10 tells us that ‘the testimony of Jesus is the Spirit of Prophecy’…. I’d appreciate your prayers, as my vulnerability, which I’m aware of, is open to being abused. It’s never easy to be betrayed, especially by people you once trusted: over the last goodness knows how many years, it’s happened a few times – maybe I’m just not a good chooser of friends! – but I just want to say – whatever you do – please, don’t take C S Lewis’s first option, and be closed. It’s what has damaged Christians for generations, and yes, you risk meeting people who want to control you, are jealous of you, maybe even want to stop you: but to love is the only option…..God will deal with the controllers, the abusers, even if we don’t ever know how. 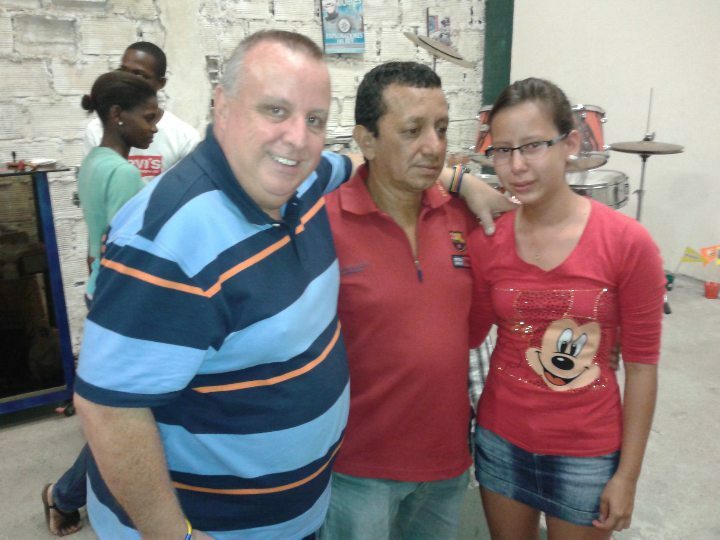 I look at the picture on my Facebook profile page often: the adorable Ana Beiba, and her total unconditional love for over 100 (now) of society’s rejects: the elderly people with whom she not only shares her home, but her life, her time, her love, her heart, her compassion. I’ll never forget being at her home in April this year: the first thing she showed me after I’d arrived, with my little troupe, was the death certificate of an 88 year old ‘baby’ of hers, a gentleman who’d died the day before our visit, the tears ahe wept for a man to whom, for a time at least, at the ‘back end’ of his life, had given a home, companionship, food, love, care, clean clothes…. and she couldn’t afford the 400,000 pesos (then, about £140, US$220, AU$215) for his funeral. If he’d died on the street, where she rescued him from, she wouldn’t have had that worry: but then, nor would that lovely man have spent his last days in comfort. You risk when you love. Ana Beiba is constantly vulnerable to the loss of more ‘babies’, which is one of the reasons I’ll move heaven and earth, if I have to, to help her…one of the reasons I love who she is, what she lives for, and how she lives. In the west, we’re such a ‘restrained’ race: I’m pretty open with telling people I know and love that I love them. Some people find that hard: not quite sure how to respond. Jesus said ‘Love one another’, not maintain a stiff upper lip and keep your feelings in check – ‘and by this will all men know that you’re my disciples’. I love Latin America, Africa, and some other places, because a much larger number of people will tell YOU that they love you….and believe me, it’s not too difficult to do! And, of course, the kiss on each cheek.. it is so totally affirming…. and a wonderful blessing. Belfast & Cali… more good news…. Last night, I had the privilege of speaking to the Intercessors and Partners of a terrific ministry here in Northern Ireland – Times of Refreshing Ministries. Headed up by Brian & Jean Patton, it was a genuine delight to be with them last night. I think it’s wonderful how God calls and equips people in different ‘areas’ of ministry, and then, quite wonderfully, brings them together. Those of you who know me well – even quite well! – will know that, when it comes to praying for people, I’m not a ‘hit and run’ person, not a ‘pusher-over’, but I love – NEED – and want to engage with people, as everyone who comes for prayer is an individual, not just a ‘pray-ee’, so I like to take time, albeit sometimes only a few minutes, to get to know who I’m praying for. Brian & Jean, and TRM, have a ministry that is wonderful in its counselling, its training courses (http://www.trmbelfast.org/aboutus.htm). They have endless patience, great skill and gifting, at unlocking issues in people who need to be out-of-the-way before they can REALLY become the people God wants them to be. I love the fact that they could – maybe will, in the future, who knows? – pick up people I’ve only had a few minutes with. Truth is, I’m not an intercessor or counselling: just someone who loves people: I don’t really have the patience to ‘counsel’ someone for hours and hours, whereas these friends do. Brian & Jean asked if I’d just share some encouraging stuff with their staff and partners, and – of course! – there were lots of them to pray for afterwards! When my friends Andrew & Valerie Barr first introduced me to them, we realised we’d already met, many years ago (it’s got to be at least 10-12, maybe more), in a ministry time at a Healing Conference in St. Paul/Minneapolis, Minnesota, USA. Full circle – how does God do that? He’s so good at the fine-detail, isn’t he? 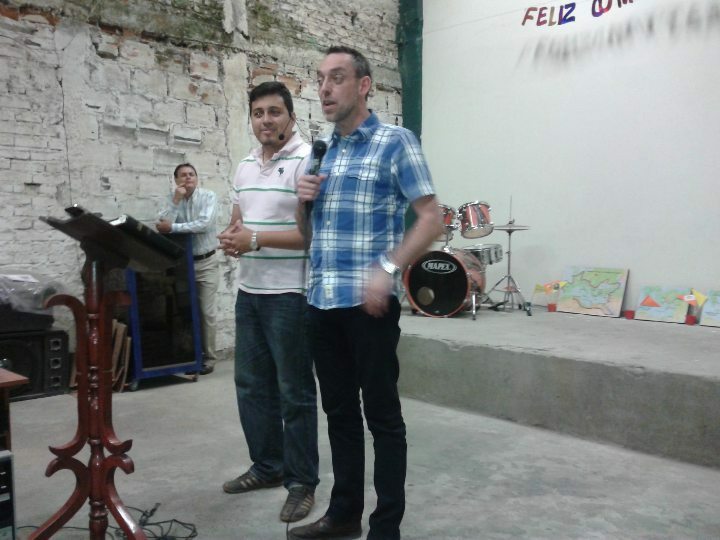 Wilmar is now in Bolivia for 3 weeks, so please, would you pray for what’s begun in those guys in Siloe: I know I’ve said this before, but the ramifications, the significance, of this, could be massive. I’m so thrilled that people in that sort of community and lifestyle seem to like me! I’m old enough to be at very least ‘dad’, more likely ‘granddad’, and, for some of the really young lads who have had no alternative to this sort of lifestyle as they’re born into it – I’m old enough to be their great-granddad! Maybe that’s something of the favour of the Lord: I know that I’m so, so grateful for God’s favour. Please pray that God will continue to move in that poor widow’s life and family. God’s Presence in her home, despite it being a ‘siccario’ agency, was so tangible, please pray that God would just love her, and be with her and her lovely kids in these days while Wilmar is away. I’m looking forward to next weekend, speaking at Fresh Springs Church, Seaford, East Sussex: Seaford’s where I went to Junior School, with a psychotic fiery Yorkshire woman who hated me ‘cos I was left-handed… I’m not sure I’ve really ever been back to Seaford since leaving that school! I DO remember being caned 4 times a day, at least, for the last 4 years there: but I forgave her, many years ago, don’t worry! I’ve…er… tried to create a page on Facebook for the weekend – meetings Saturday (3 pm and, I guess 7.30 pm), and church on Sunday, probably 10.30 am) – but my tech skills are sadly lacking even for such a simple job as putting that page together! If you’re free Saturday, it’d be lovely to see if you’re in shouting (or driving!) distance of Seaford: if you have no church and are free Sunday morning, then too: but I’d never want to encourage people away from their own church. The church was planted, and is led, by long-time friends Peter & Tricia Hindley: yet another relationship forged way back in the annals of time! The meetings are in the Clinton Centre, Clinton Place, Seaford, BN25 1NP: from my memory of the town, that’s the main street in the town, the main Eastbourne to Brighton road. How do I begin to summarise what was, perhaps, one of the most remarkable trips I’ve undertaken in almost 30 years? It’s so difficult to encapsulate what God did during 20 days in the wonderful country of Colombia: the funny thing is, that if you’d told me 20 years ago I’d even MAKE that statement, I’d have laughed, as then, there was no way I would – humanly – have even thought of going there, because of its history of civil war, still going on big-time when I first went in 1997: still going on now, though much has changed for the better. As I look back over 17 years (nearly!) and 51 trips, it really does seem that, every time, God does more, stretches me more, astonishes me more. And for that, I’m eternally grateful. If God had told me, when I started travelling, some of the countries I’d go to, I’d have laughed and said ‘No way!’. Instead, he ‘teased’ me in 1987, when the ‘call’ to travel was undeniable and irrefutable, with a couple of trips to France, one to Hong Kong, and another – to which I objected strongly, but couldn’t refuse God’s persistence – to Ghana. France was, back then, one of my favourite countries, so no problem there. Hong Kong in ’87 was still ‘British’ so I felt happy about that, as well as it being a ‘gadget shopper’s paradise’. Sneakily, God dangled HK to get me into China: petrified then, but again, eternally grateful since… Ghana began a ‘love relationship’ with Africa that has never died: just not the opportunity, or the time, to go there too much in recent years. Why? Because I’d never thought to tell God I didn’t want to go to Latin America: more specifically, South America. Again, God sneakily ‘teased’ me to go there with the temptation of a ‘chilli-eating’ contest in Mexico: a country still right at the top of the agenda for me, along with Colombia. 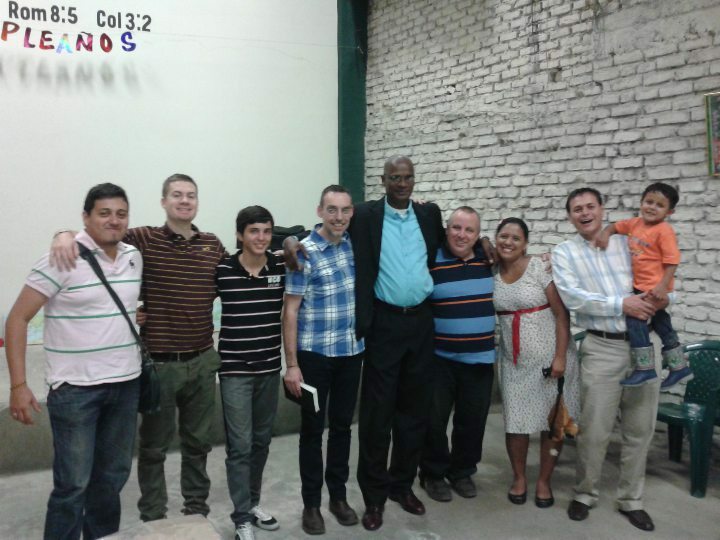 It was in Mexico that I met Argentinians, Brazilians, Salvadorans, and Colombians…. and there’s been no looking back: less still, no desire to stop going. Just the opposite, in fact. Every trip to Colombia has, it seems, surpassed the one before, every trip producing different experiences, of God’s heart, His love, His power. And, for the most part, people I’ve taken with me, find the same desire to go back, at least a few times. This trip was no different: Simon there for the third time, Robert a second massive undertaking to go from Australia. Already, for the next trip, my friend Chris Spark has his name on the list, his third visit. Why? My only explanation can be, and is, that perhaps because of it’s last 50 years of bloodshed and the stigma of it’s drug ‘industry’, God is opening the heavens over the country more and more. It really IS, in my experience of 100+ countries, the country with the widest aperture of heaven over it! Jesus said to John the Baptist’s disciples, in Mark: ‘Tell John the deaf hear, the blind see, the lame walk, the dead are raised, and the Good News is preached to the poor’. That would be my summation of 17 years of going there: all we DIDN’T see over the last 3 weeks was the raising of the dead: but then we didn’t come across any dead people! I suppose we COULD walk unannounced into funeral homes, but generally it’s ‘politic’ to have the request from relatives of the deceased to bring them back! 21 years after shaking the hands of two ex-dead ladies in China, God did that miracle in Colombia (2008): he’ll do it again one day, of that I’m sure. Eleven people, blind/blind in one eye/or nearly blind, saw: nine people, deaf/deaf in one ear/or minimal hearing, heard. An 86 year old man, Joel, effectively paralysed with compressed vertebrae (no use of arms or hands, decreasing use of legs that ‘weighed a ton’, leaped, squatted, and gripped hands so tight. Elizabeth, also 86, effectively paralysed in that she couldn’t even change sides to lay on in bed, and if she tried, she screamed with pain, walked. Her daughter, Lisa, severe scoliosis, felt her spine move and straighten. Daniella, 13 years old, with asthma, terrible eyesight, and ‘severely’ flat feet, breathed easily, saw perfectly, and had arches formed in less than 15 seconds. Countless knees were healed: arthrosis and arthritis disappeared. Gonzalo, with muscles & tendons ripped from the bone in his shoulder, and his supra-spinatus tendon ripped, healed. In fact, just about every disease was healed: every affliction cured: and by whom? Just a bunch of ‘ordinary’ lads who choose to believe that God honours the promises of Scripture, and who, despite very real failings (especially on my part, though who doesn’t have them? ), believe that they – we – can and will do what Jesus did….and whatever the greater things than Jesus did are, we’re up for them, too…. 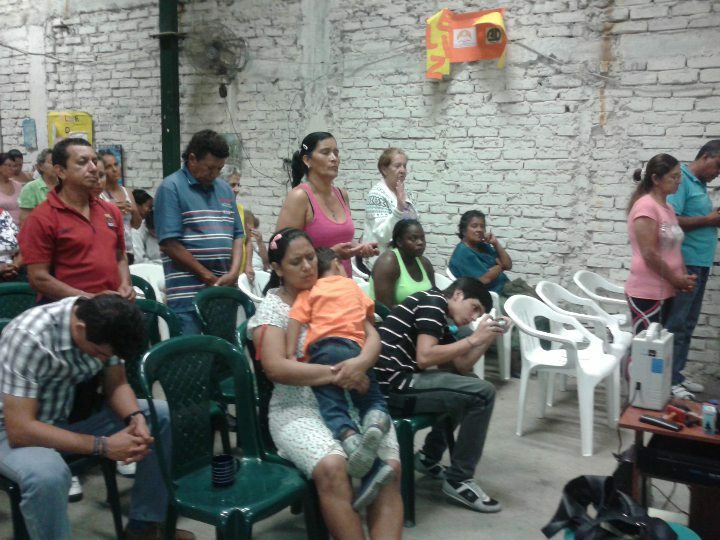 What’s the reason why God seems to do so much in countries like Colombia? Well, Daniella was suffering from an asthma attack when she went to church: people with migraines GO to church because they’re more likely to get healed there than if they stay at home…. in the western world, such diseases would be the reason we DON’T go to church. 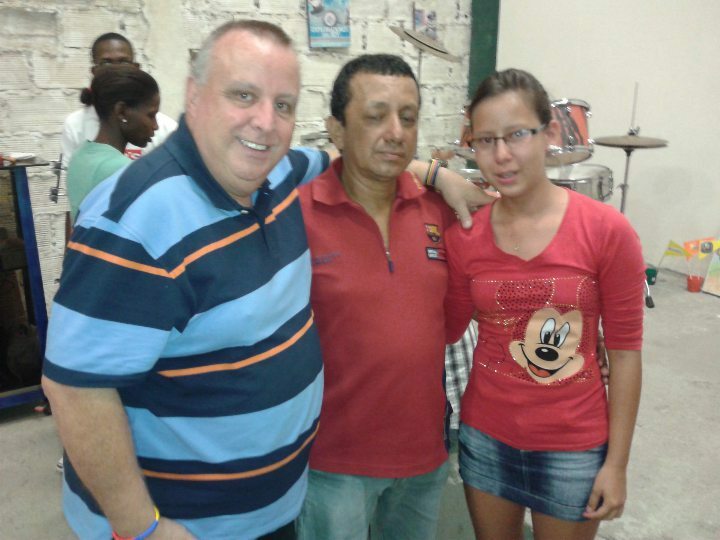 A young lady, Marlene, received the miracle of healing of deafness, right at the beginning of the trip. Without knowing where we were going to be in church, so she could bring a friend for healing, she spent the next two weeks going to different churches with her friend in the hope that she’d find us. She did. Her friend was healed instantly. These are the sorts of ‘events’ where Jesus would say, ‘Your faith has made you well’. And so that’s what I said to her friend. Marlene then prayed for another lady, deaf in her right ear, as she had been: she heard. My friend Simon Guillebaud is writing a 365-day devotional book. In Burundi, Si sees countless miracles of salvation and healing. He wondered if using John 14:12 would make some people ‘feel’ helpless: the only reason people MIGHT feel helpless is because of choice – the choice not to take the ‘risk’ in case it ‘doesn’t work’. You know, over the last 27 years of doing this ‘stuff’, I’ve increasingly realised I can’t do anything, except be obedient to what God says. My part is just that: to be obedient. It’s not my place to heal, simply because I can’t DO that. But I can PRAY: I can RISK: I can COMMAND in the name of Jesus. And the bolder I’ve become in doing the latter, the more I’ve seen God do, over recent years. It still blows me away, nonetheless…. every time someone gets saved, healed…. And then, of course, there is what is the beginning, I pray, of a revolution among some of the ‘favela’ communities: some of you might think this is an unlikely thing to say, but it’s a real privilege to be involved with them, and to know that – as one has definitely said – they trust me, and it’s a wonder to see God start the work of transformation in so many of their lives. To sit and pray with them is a blessing that I can’t even begin to explain, least of all understand, how little old me got to be with them! Phew… the eternal problem of delayed or lost luggage! Mine didn’t arrive back at Heathrow when I did, but I was assured it would be in Belfast when I got there…. one piece was, the other wasn’t… and then you’re desperately trying to remember what was in it just in case you have to make a claim. Who knows how difficult it is to remember what’s in your bag…? Finally, it arrived yesterday evening, so I have to be grateful for that, though the baggage company wouldn’t have delivered it until tomorrow… so it was back to the airport again to collect it. Then, it’s an unspoken prayer of thanks when you realise what you could have lost…and not remembered you’d lost it until it becomes too late to claim for it. I lost two bags en route from Newport News, Virginia, to Houston, with all my family’s Christmas presents as well as my clothes, on one occasion, courtesy of the dreadful Delta Airlines: perhaps they rival Iberia for the slot above Ryanair! So it was out to buy clothes and a bag for the return journey: which Delta kindly lost again! Anyone want to ask why I refuse to use that airline anymore? (They’re in the same network as KLM…. ’nuff said!). It’s almost like Christmas when your luggage finally comes home, and you realise you’d NEVER have remembered THAT item in a claim….I’d challenge anyone to remember what they packed in which bag a few days after packing them! And last night, for someone who, until the past few months, must have been one of the world’s WORST sleepers (until I discovered magnesium aerosol sprays, one specially formulated to help you sleep) I slept from just after midnight to 1 pm. Ooops, sorry, church, but I guess I was tired, and I’d rather not sleep in the sermon as it’s embarrassing, and my bed is more comfortable…. And still so eternally thankful to God, who loves me, and the God whom I love, for such an amazing trip to such a wonderful country, and for sleep, which for the first 59 years of my life frequently passed me by, and now I love sleep…. it’s nice, ain’t it?? Thank you, Father! …even if it is only 12 degrees centigrade compared to the lovely warmth of Cali! It’s a bit of a culture shock though: feels far lower than 12C to me! Back this morning, after what could have been an arduous trip, certainly a long one, but I was blessed with an upgrade, to Business Class, with no one near me in any other seat, and I slept like a log for about 8 hours, a rarity for me on a plane. Trouble is, I’ve been upgraded quite a few times now, and it’s all the more difficult to go back to sardine-class when the next long haul comes around. I realised on the flight that I was much more tired than I thought after such an amazing 3 weeks. And to be honest, I’m still dazed trying to take stock of everything that happened on the trip. Of all the 51 trips I’ve made to Cali, the one in July and this past one were utterly stress-free, well organised, busy enough but not overly so, which is a good thing when you never know how long the prayer ministry time will go on for at the end of each meeting. Some lasted hours…. a blessing, but utterly draining. I said in an earlier blog that I’ll try and summarise the trip in one blog: though I don’t know quite how to fit in, in one ‘readable’ length blog, all that happened. The guys I took with me were all brilliant: Brian is lovely, and he went from thinking he had not much to say, only pray for people, to preaching in churches on his own (that is, without me! ), and was blown away by what happened. Robert excites me as he’s moved from ‘not faith’ to ‘extreme faith’ in a very short period of time – about 2 1/2 years. It’s thrilling to see his authority. Nick took to a return to Latin America for the first time in 13 years like he’d never been away, his Spanish flooded back, even more as the week went on. Simon preached so powerfully, and was so bold in some circumstances it was breathtaking! Seems weird putting the central heating on when the first thing you do when you get back to the apartment is put the ice-cold air conditioning on! And so, now 2 weeks at home, with a lovely meeting coming up in Belfast , at the Waterfront, on 22 November. On 27th, I’m due just a ‘check up’ echo cardiogram, and then on 30 November, a flying visit to speak at a church in Seaford, East Sussex, the town where I went to junior school, and have hardly been back there since! Saturday night and Sunday meetings there, and then, always a thrill, back to France on Thursday 5th December, for a long weekend in Rouen, at ‘Le Gospel’ church. My great mate, Mark Hendley, is coming with me on that one. So, to try and mentally chill out, as well as physically take it easy: not an easy thing after the maelstrom of God’s power over the last 3 weeks. Fortunately, England start defending the Ashes in Brisbane next week, so I’m sure I can find something to pin me to my recliner! And then of course, there’ll be loads of live football…. Thank you all so much for praying for us while we were away: all home safely, and changed men as result…. Last day in Cali: a few more reflections…. 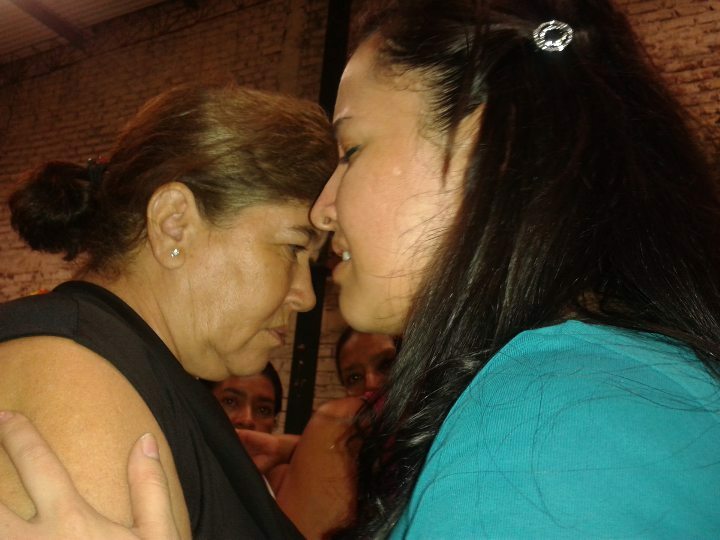 As well as the outrageous blessing God poured out during these 3 weeks for miracles and healings, humbling enough to be on the end of the divine power-cable: there was, of course, the ultra-blessing and humbling as one of Ana Beiba’s dreams was fulfilled. Like all rightly-aggressive Kingdom builders, she’s got more dreams in her spirit, and I hope that I might be a part of seeing God fulfil those for her, too….I’ll never forget the her reaction (http://www.youtube.com/watch?v=t4mF-TrAiac), and that memory will stay with me until I stand before my Heavenly Dad, and His awesome Son…. When Dario said to Wilmar that he could trust me, it was because, he said, that I wasn’t afraid him, when 99% of other people are. That blew me away, and I’m thankful to God, that from a relatively fearful family, God’s changed – and is still changing – my life. I real LIKE my new friend! Thank you, thank you, thank you God: thank you Jesus: and thank you Holy Spirit for your Presence, even in a siccario house. Where would Jesus be, if her were still walking around on earth? In places JUST like that…..
More great news….last day + 1! If you’ve followed these blogs over the last few weeks, you might recall that last week, we were aked to go and pray for a Pastor, Dario, and his son, Ivan, in King David Hospital. Dario had been rushed in vomiting black blood, a suspected cancerous ulcer in his stomach: Ivan was in with Dengue fever and breathing difficulties. 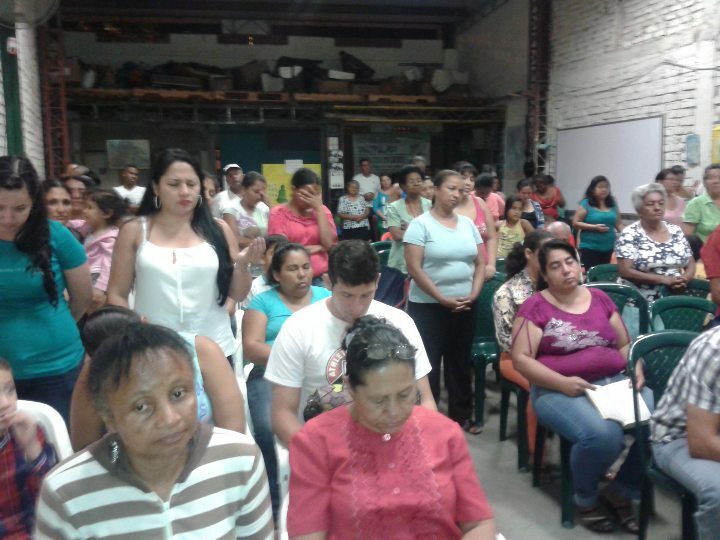 As sometimes happens, I don’t get to hear of the outcome for a long time, if ever: but Pastor William Castaño, who has become an increasingly regular name in my Colombia diaries, who had asked us to go to the hospital to pray for them, told me that both had gone home the next day, healed…. Wonderful God! Flor doing what she couldn’t do for 40 years! reaction of Arsenio when God gave him back more than double what had been stolen from him. And little Hernan Gonzalez, healed of pre-birth brain damage, and his legs the same length after a 3 inch difference…..
It’s an unbelievable privilege, so, so humbling, and exciting all at the same time. This morning, Simon & Nick went off home: it’s dead quiet here in the apartment now, and a strange feeling as I was thinking I should be boarding a plane for Madrid in in just over an hour – not 25 hours! It gives me a day longer to see my dear friend Wilmar, tomorrow, all being well, and see if I can pack all the coffee that I’m bringing home! Surreal to absolute sublime….. God of Wonders, yet again! For the whole of this trip, I’ve been thinking I leave a day after Simon & Nick: but they told me that their tickets had been wrongly booked and they were going home a day later than they planned, tomorrow. So, in my (now aging and clearly un-memorable) head, I was leaving tomorrow, too. Obvious, huh? There’s something that happens in your head when you think you’re going home: it’s not that you don’t want to be here (I do, and I’m glad I have an extra day), but your psyche settles into a mind-frame of packing and leaving, arranging transport for everyone to the airport, then suddenly and – very surreal – you’re not going…. I’m re-geared in this tiny mind of mine now, and look forward to a knee-relaxing day tomorrow and much of Thursday (I fly at 10.10 pm)! 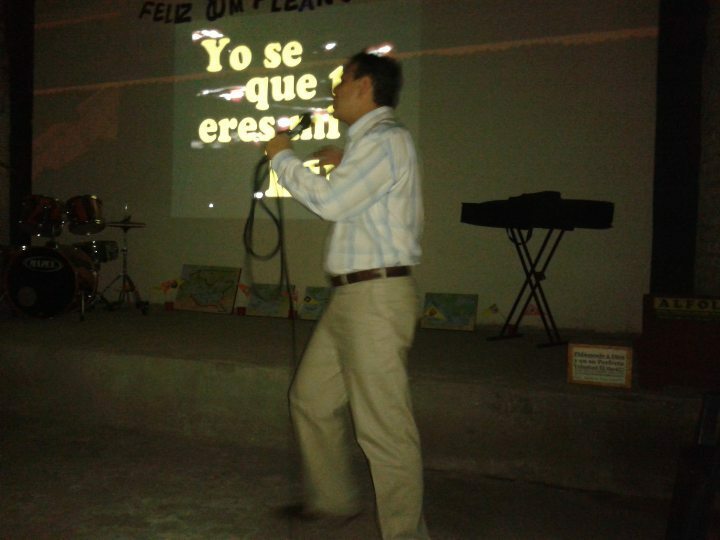 Tonight, supposedly my last night, I’d asked Wilmar to contact a lovely couple, Hernan & Aida Gonzalez, whom he didn’t know, when I first got here, as I knew tonight was ‘free’ and had no meetings on Pastor’s William wonderfully organised schedule, to see if we could go to their church in a very dangerous barrio, Simon Bolivar (apparently the highest %age of siccario killers live in this district). 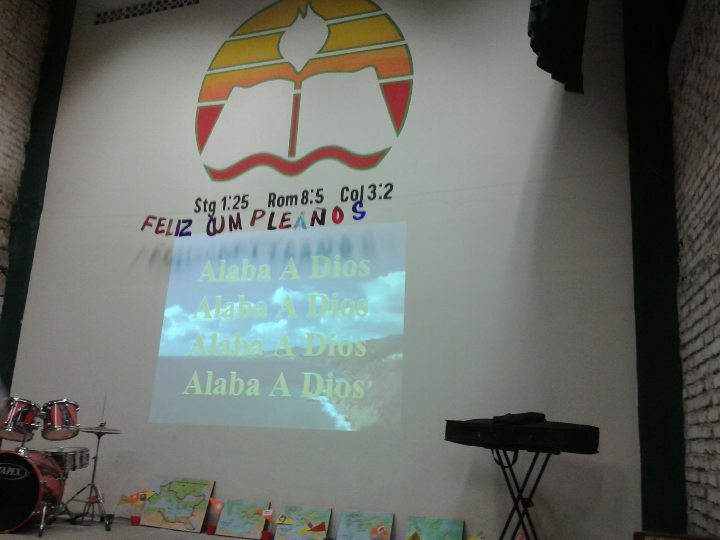 I’ve been there many times over the last few years, so it was a joy to go back to their church, simply named John 3:3. 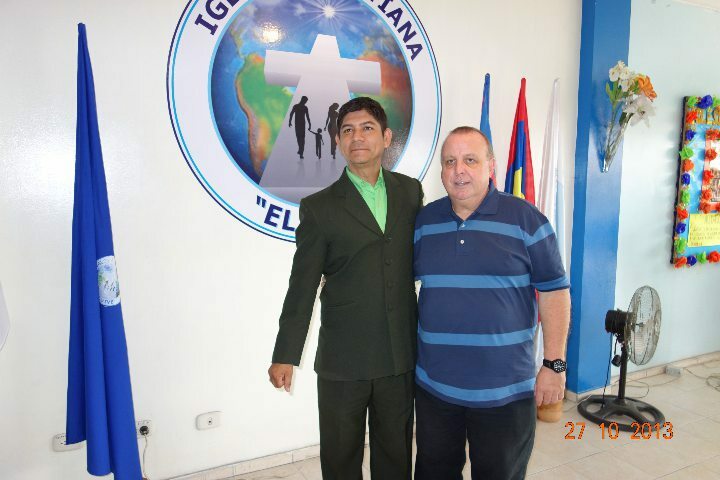 Imediately, he got a dear man, Gonzalo, whom I prayed for a year ago, to come to the front to testify to a miracle he’d recieved then – a totally ripped and wrecked cartilage in his right shoulder, which was healed immediately. Tonight was the first I knew of it…. then Hernan testified to the miraculous of his gorgeous little boy, also Hernan: he had, when I first met him, severe brain problems, as well as one leg considerably shorter than the other. Hernan testified to watching his son’s leg ‘grow’ – about 2-3 inches. He’s also totally cleared, I discovered from Aida, of all brain problems, and is perfectly healed – another miracle. Nick spoke really well, I shared the stories from this morning of the healings in our apartment, then Si spoke brilliantly. I’d told him that there were dozens of not-yet-Christians there before he preached: in between preaching and making an appeal, I’d told the story of the miracles in Dario’s home, among siccarios. 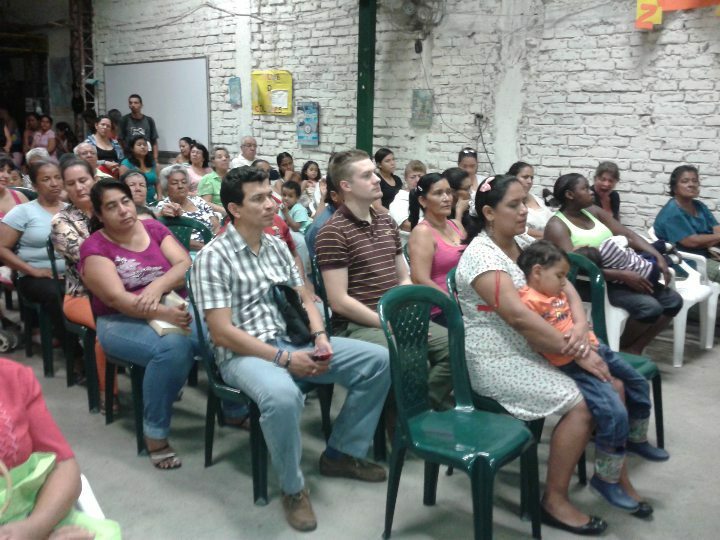 The church was packed to the doors, with people standing right to the door, over 100 at least, when Si made the evangelistic appeal. At least 60 responded, and gave their lives to Jesus. Then we ‘tried’ to get people to place their own hands on their own sick/damaged/injured bits: a few testified from the front to instant healings, including a lady who’d not been able to move her arms above horizontal for years, and could raise them, and another who’d been released from hospital today with a terrible painful stomach disorder (how many westerners would go to church on the day of release from hospital still in pain, I wonder???) that the doctors said there was nothing could do about it… she was healed instantly. Then… despite having tried to stem the tide with people praying for themselves, the tsunami began…. I’m so glad it did, because there were SO MANY miracles, it was unbelievable. Victor, very tall man, basketball height, dancing in the worship. 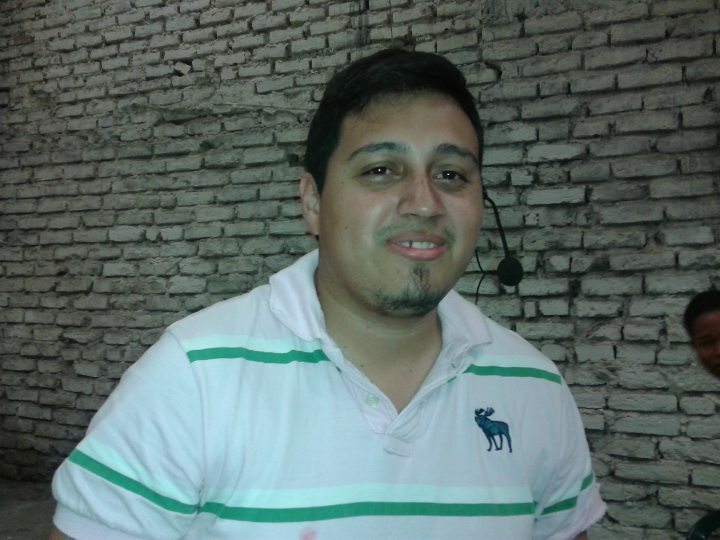 Hernan, the pastor: it is his birthday today, Tuesday. What a birthday! Pastor proper preacher Englishman Simon in action! 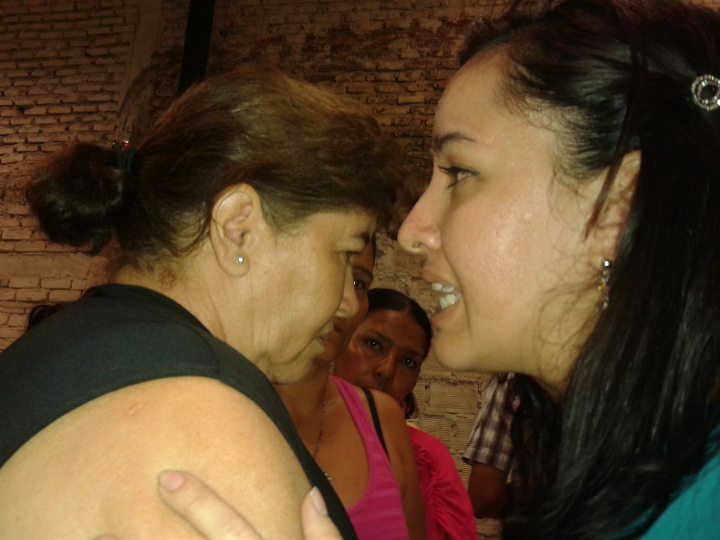 Marlene, deaf 2 weeks ago, praying for a deaf lady – miracle! With Gonzalo, her dad, pre glasses removal! The next lady was def: so I got Marlene to pray for her, just encouraging her to go for it, I held the deaf lady’s hands: she heard immediately. A lady with hugely reduced sight, saw perfectly. 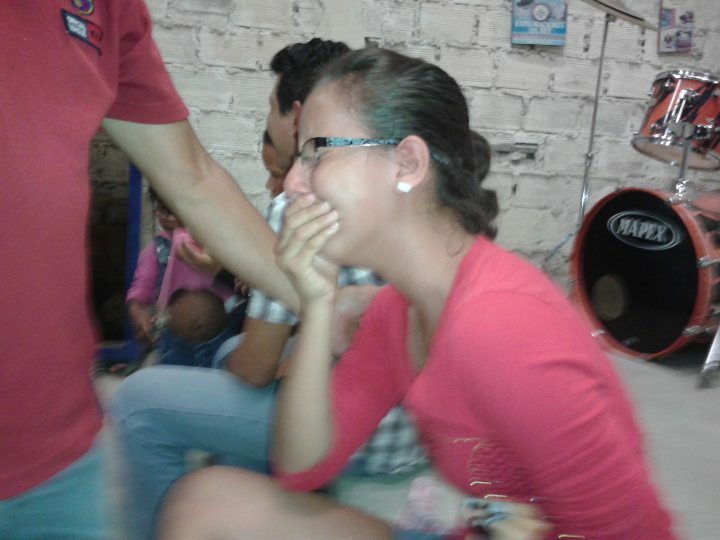 Then, Gonzalo’s daughter, Daniella, 13 years old, came to me: initially to get prayer for asthma, then saying that her feet hurt her terribly, with a doctor’s prognosis that she had ‘severely flat feet’ and that she’d have to ‘live’ with them…. her breathing changed instantly, she felt a real ‘ease’ in her lungs. Johan, translating for me, was then totally gobsmacked as I prayed for her feet, and within 15 seconds – no exaggeration – told her take her shoes off…. she did, then fell back onto the stage weeping as she perfect arches! God’s sense of humour again 😉 – my knees, over the last 3-4 years, have radically changed my gait, and my feet are as flat as pancakes! As she was about to leave, I said, ‘Would you like your eyes healed, Daniella?’ (she’d got pretty strong prescription lenses in her glasses). Yes…. her distance vision was virtually zero. 20 seconds more, and she was reading a difficult-to-read poster at the back of the church….. The next lady had terrible sight problems, so I called Daniella back, and told her to pray for the lady. She did – only about a minute. The lady saw perfectly. God’s so flippin’ marvellous, it leaves me breathless, if not speechless! She then prayed for her mum (so Gonzalo, of previous miracle history! ), all of whose body pain went, and whose sight – reading problems – began to be restored, initially with feeling a huge pressure from the back of her eyes, as her daughter prayed for her. I told Daniella to keep on praying for people, as God had ‘miracles’ her, and he heal and do miracles for others through her. 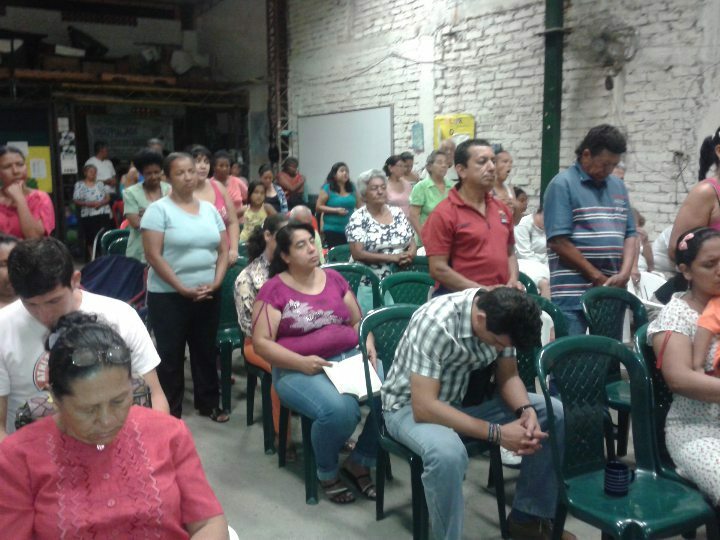 EVERYONE we all prayed for was healed….Hernan & Aida were in the 7th heaven as they have so many new believers. Why? Hernan, two weeks ago, put signs on the church door, saying miracles would happen, then round his very dangerous barrio, inviting everyone. God isn’t going to say no to faith like that. is he? 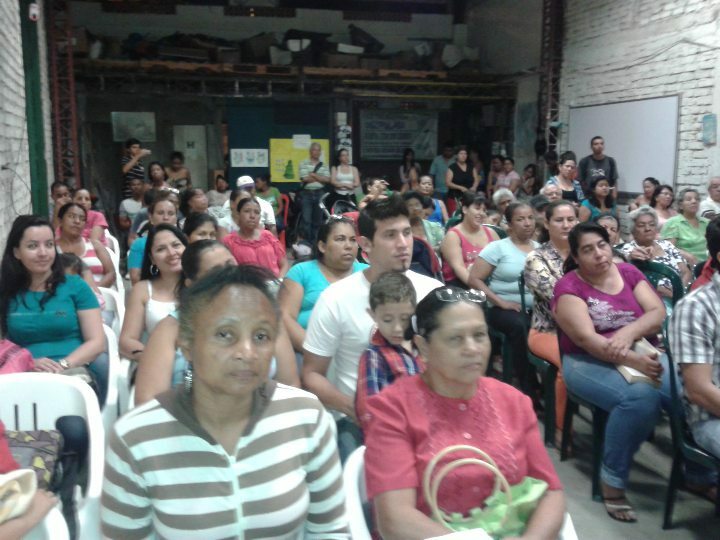 AND… Hernan declared it right at the start of the meeting, that miracles WOULD happen…. that’s faith! The picures are all over the place – sorry, but it is 1.15 am! !